These Paper Flower Decorations look great on their own or make a bunch and hang them for a colorful, unique spring decoration for the home or classroom! 1. Cut strips of paper about 1" wide. 2. Roll your paper into circle to make the center of your flower, taping together to secure it. 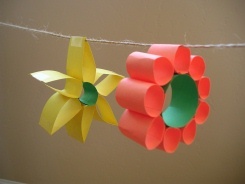 Make more circles or shapes with your paper and glue them onto the flower's center. 3. Make as many as you'd like and string them on some yarn to hang up around the home or classroom, a great spring time decoration!